Docky is an awesome dock application for Ubuntu/Linux. Docky started off as a simple theme for Gnome DO, another popular dock application, and later own became a dock application on its own. 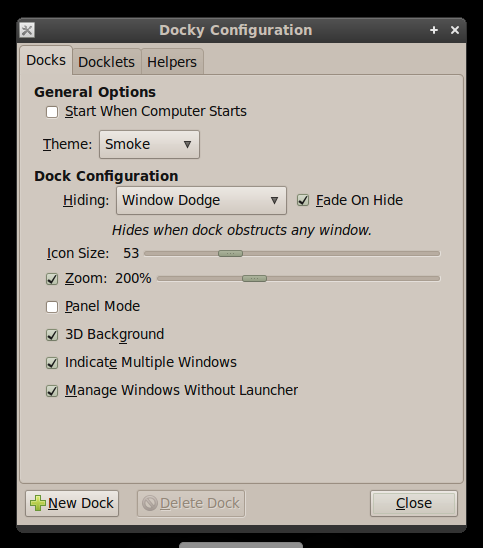 Docky is widely regarded as the most user friendly among the dock applications available in Linux. Looks and feels so lightweight. Simple and intuitive. Perfect candidate for daily use. The Docky tweak menu is perfect. Everything you want, nothing you don't. Docky tweak menu has a plethora of customization options. Options like Window Dodge and Intellihide and really useful and by far the best I have seen in any dock application. As you can see, I have used the Window Dodge option and it works exactly the way you expect it to. How to Install Docky in Ubuntu 10.04 'Lucid Lynx', Ubuntu 9.10 'Karmic Koala'? Latest version of Docky is available in Docky-Core PPA. Open Terminal(Applications - Accessories - Terminal) and copy-paste the following line into Terminal. Done. Now update repositories and install Docky in Ubuntu Lucid 10.04. Now goto Applications - Accessories - Docky to launch the application. You have a 'Start when computer starts' option right in the Docky toolbox so that you don't need to manually enter that in the startup sessions for Ubuntu. Enjoy the Docky experience and tell us how it feels.